The Institute of Cetacean Research: (ICR, 日本鯨類研究所, Nihon Geirui Kenkyūjo) is a non-profit organisation in Japan which claims to be a research organization specializing in the "biological and social sciences related to whales". Its methods include lethal sampling techniques which have been the source of international controversy over the validity and necessity of the research. Several environmental groups and governments oppose this program, claiming it to be commercial whaling in disguise, which is banned by the International Whaling Commission (IWC). The Institute of Cetacean Research was founded in 1987. It took over from the Whales Research Institute (founded in 1947), which grew out of the Nakabe Scientific Research Centre (founded in 1941). The New Zealand-based spokesman for the group is the public relations agent, Glenn Inwood. The Whales Research Institute conducted research based on catches from commercial whaling. The International Whaling Commission (IWC) established a moratorium on commercial whaling after 1986. The ICR was established the following year to continue the "scientific research". Japanese whaling fell sharply after the global commercial whaling moratorium. The ICR may still kill whales for scientific purposes. The meat is then sold. "... any Contracting Government may grant to any of its nationals a special permit authorizing that national to kill, take and treat whales for purposes of scientific research subject to such restrictions as to number and subject to such other conditions as [that] Government thinks fit." "Any whales taken under these special permits shall so far as practicable be processed and the proceeds shall be dealt with in accordance with directions issued by the Government by which the permit was granted." Since its establishment, the institute has been granted annual catch quotas by the Government of Japan to carry out its research. The whale meat, which is by definition a by-product of the research, is sold for domestic consumption in accordance with the convention. From 1988 through the first half of 2011, a total of 13,663 whales have been caught by the ICR under the above exemption for scientific research. Of those, 3,573 whales have been taken in the North Pacific Ocean, and 10,090 have been taken in the Southern Ocean, an area which in 1994 was designated as the Southern Ocean Whale Sanctuary by the IWC. In March 2014 the International Court of Justice (ICJ) ordered Japan to cease the JARPA II programme stating that its Antarctic whaling was in contravention of the IWC moratoria 10(e) and 10(d). Biological research including the collection of samples from the Antarctic Ocean and the northwestern Pacific Ocean under special permit from the Government of Japan (JARPA and JARPA II programs). Samples are used for studies related to estimation of biological parameters, resource abundance, elucidation of stock structure, and the role of whales in the marine ecosystem, and elucidation of the effect of environmental changes on cetaceans. Conducted in the southern hemisphere and the north Pacific to elucidate trends in abundance, density, distribution, and behavior of whales. These surveys include the IWC Southern Ocean Whale and Ecosystem Research (SOWER) Program. The ICR also conducts research with the objective of promoting normalization of IWC activities in line with the ICRW objective of the sustainable use of whale resources. Collection and analysis of marine mammal stranding records on the coast of Japan. The program took place near Antarctica from 1987 to 2005. Its stated objectives were to determine mortality rates, whale stock numbers and structure, the role of whales in the Antarctic ecosystem and how environmental changes affect whales. The whaling operation alternated between several pre-established areas intending to take 400 or more minke whales per season. In 1997 the IWC scientific committee officially reviewed the JARPA program. The committee expected reasonable precision and usefulness of the data collected but disagreed on whether lethal methods were necessary. It was also noted that the results could potentially allow for an increase in the number of minke whales annually taken. In the final 2007 review the committee agreed with the initial 1997 mid assessment. It recognized that progress had been made in identifying stock structure and at least two stocks were found in the research area. Agreed estimates of abundance could not be developed and preliminary estimates may only reflect major changes in abundance over a long time line. Problems were identified with age and mortality rate data. Krill-related work was welcomed but relatively little progress was made toward understanding the role of whales in the Antarctic ecosystem. Data on pollution was also welcomed but disagreement continued over the analysis of the results. Levels of toxic pollutants were lower in Antarctic whales than those sampled in the northern hemisphere. The commission made note of the fact that the catches took place in the IWC established Southern Ocean Whale Sanctuary and that improving management of whaling in a sanctuary is unnecessary. The 2007-1 resolution on JARPA is one of several calling on Japan by majority vote to suspend its lethal research. Like its predecessor, the whaling program takes place near Antarctica. Starting in 2005 and continuing to the present day, purported objectives include monitoring the Antarctic ecosystem, modelling competition between whale species, recording changes in stock structure and improving future management of Antarctic whales. The program calls for hunting 850 or more Antarctic minke whales, 50 fin whales and 50 humpback whales per season. Note, however, that the quota for humpback whales has not yet been implemented, due to intense international opposition. Disagreement over the value of the research, the use of lethal methods and the sample sizes continued in both the scientific committee and the commission. In 2005 and 2007 the commission passed resolutions by majority urging Japan to stop all lethal research in JARPA II. From 1994 to 1999 Japan carried out its program JARPN in the western north Pacific. Its stated goals were to improve knowledge of stock identity, improve implementation simulation trials for north Pacific common Minke whales and act as a feasibility study for a program on feeding ecology. The program called for 100 minke whales to be killed annually. The results were reviewed by committee in February, 2000. The committee agreed that the information was useful for management but no consensus was reached on whether lethal methods of research were necessary. As with JARPA, the IWC issued resolutions calling for Japan to cease issuing permits for the take of Minke whales citing concerns over the need for lethal methods such as the 1999-3 Resolution on whaling under Special Permit. JARPN II began with a feasibility study from 2000 to 2001 to continue taking whales in the western north Pacific Ocean including 100 common minke whales, 50 Bryde's whales, and 10 sperm whales. The stated objectives of the program included study of feeding ecology (such as prey consumption), stock structure and the environmental impacts of cetaceans. In 2002 after the completion of the initial study Japan proposed and began a long-term program to study how feeding ecology relates to sustainable use in the Pacific and within Japan's Exclusive Economic Zone. In 2008 the program included a proposal for an annual take of 340 minke whales, 50 Bryde's whales, 100 sei and 10 sperm whales. Disagreement over the objectives, methodology, effect on stocks and overall success of the program continued in the scientific committee review of the feasibility study and full program. The full program introduced a change from previous use of the ICRW Article VIII research provision by not specifying an end date. The objectives were deemed unnecessary for stock management by some members and would not contribute significantly to previously identified research needs. The sample size and methods proposed were unlikely to satisfy program objectives and the ecosystem modeling was considered to be poorly developed. Some contended the program placed undue emphasis on assumed negative effects of cetacean predation on fishery resources while failing to address the effects of fisheries on cetaceans. However, others believed determining the effects of cetaceans on fish stocks and more information on Minke stock structure to be critically important. Some stated the feasibility study would provide valuable information on methodology and other aspects of the program would improve over time and contribute to fundamental questions. The committee identified that the pollution objective did not contribute to the goals of the IWC Pollution 2000+ project but remained relevant to the IWC for long term study. Disagreement over the value of data obtained through lethal methods continued as well. Some argued that a wide range of questions could be answered through non-lethal means such as "for pollutant monitoring (biopsy sampling for fatty acid and stable isotope analysis), for stock structure (photo identification, biopsy sampling and faecal sampling), and for feeding ecology (faecal sampling)." Others argued that prey data was required for modeling purposes that could not be acquired through non-lethal means. However, feeding ecology was not necessarily relevant to stock management according to some who argued biopsy sampling would allow for a greater amount of statistical data. Argument continued over the potential negative effects of catches, such as stock depletion of O-stock and J-stock whales, when the only data on many of the populations came from selective extrapolations of JSV (survey) data. Proponents contended that the JSV data was reliable and the research area extended from coastal areas to offshore areas thus limiting pressure on coastal stocks. In 2000, 2001 and 2003 more resolutions were passed by the IWC urging Japan to cease issuing special permits for whaling and limit research to non-lethal methods. The most recent Scientific Committee review was conducted in January, 2009. Several environmental groups and governments oppose the Japanese research program, claiming it to be "a disguise for commercial whaling". The Institute of Cetacean Research has been reported to have "produced virtually no research of any regard"  and has only two peer-reviewed papers since 2005. In an open letter to the Japanese government, published in 2002 in the New York Times and sponsored by the World Wildlife Fund (WWF), 21 scientists declared that they "believe Japan's whale "research" program fails to meet minimum standards for credible science". 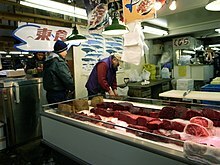 They were "concerned that Japan's whaling program is not designed to answer scientific questions relevant to the management of whales; that Japan refuses to make the information it collects available for independent review; and that its research program lacks a testable hypothesis or other performance indicators consistent with accepted scientific standards". They accused Japan of "using the pretense of scientific research to evade its commitments to the world community". The Institute of Cetacean Research responded by pointing out that it has produced numerous peer-reviewed articles on cetacean science, criticised the open letter as a case of scientists making judgments outside their own area of speciality, and raised concern about their responsibility as academics to the public. The ICR further noted that the letter contained numerous errors of science and law, reflecting the level of care taken by the scientists endorsing the letter. A WWF official responded in the same journal, pointing out that "identical criticisms of Japanese whaling had been published by expert whale biologists on the International Whaling Commission's Scientific Committee" and that three of the letter's authors defending the Japanese programs had failed to disclose significant financial and organizational ties to the whaling industry. In the same issue, twenty members of the Scientific Committee of the International Whaling Commission confirmed "that the signers of the open letter correctly summarized criticisms made by researchers very familiar with Japanese scientific whaling", a fact omitted by the letter's critics, "betraying a selectiveness that pervades their article". According to them, "so little of any significance to IWC management can be obtained only from whaling catches that it is impossible to justify killing animals on this basis". A Minke whale and her 1-year-old calf are hauled aboard the Japanese whaling factory ship, the Nisshin Maru. This surveillance image was taken by Australian customs agents in 2008. The International Whaling Commission's Scientific Committee has repeatedly expressed concern for the objectives and results obtained by the ICR. In a resolution in 2007, the IWC noted that "none of the goals of JARPA 1 had been reached, and that the results of the JARPA 1 [Japanese Whale Research Program under Special Permit in the Antarctic] programme are not required for management under the RMP [Revised Management Procedure]" and called upon the Japanese government "to address the 31 recommendations listed in [the Scientific Committee's JARPA 1 report] to the satisfaction of the Scientific Committee" and "to suspend indefinitely the lethal aspects of JARPA II conducted within the Southern Ocean Whale Sanctuary". "The scientists who have considered carefully the material that has been put forward by Japanese scientists in the past, making some claim that their whaling is scientific, have found that it is without foundation. ... You do not have to kill a whale in the Southern Ocean to gain a deeper understanding of it." Animal rights groups such as Greenpeace and Sea Shepherd Conservation Society have repeatedly attacked the Institute's vessels and personnel while carrying out their duties. In 2010, an employee of the institute reportedly sustained chemical burns to his face from a butyric acid projectile launched by a member of the Sea Shepherd organisation. On December 17, 2012, the US Ninth Circuit Court of Appeals issued an injunction against Paul Watson, Sea Shepherd and any party acting in concert with them from physically attacking any person or vessel of the Institute of Cetacean Research and requiring them to stay at least 500 yd (457 m) from their vessels. On March 31, 2014 the International Court of Justice ruled that Japan's whaling program was not for scientific purposes and forbade the granting of further permits. The court's judges agreed with Australia that the number of Japanese scientific research publications were not proportionate to the number of animals killed. Two former Australian Environment ministers applauded the decision and stated their hopes that Japan will respect it. The decision of the ICJ is final and the right of appeal does not apply in this context. Japan said it would abide by the decision. In November 2014, Japan announced that it would resume hunting whales in the Southern Ocean, but that it would reduce its catch target by two-thirds. Japan's Fisheries Agency said that Japan intends to catch 333 minke whales each year between 2015 and 2027, down from 935 minke and 50 fin whales. It said the hunts were needed for collecting scientific data and were exempt from a 1986 international ban on commercial whaling. The plan also included a defined 12-year period for research, in response to criticism from the ICJ of the previous open-ended research plans. In January 2015, the Japanese Fisheries Agency announced that the ICR was launching a non-lethal whale research programme until March 28. In 2017, the researchers at Catacean Research killed 333 mink whales in the name of whale research program 67% of which were Pregnant. This act gathered controversial and ragging response from many parts of the world. There are estimates by the World Wildlife Fund that the Japanese government has had to invest US$12 million into the 2008-2009 hunt alone just to break even, and that subsidies in total have amounted to approximately US$150 million between 1988 and 2010. In 2011, the ICR was provided US$29 million in financial assistance from the earthquake recovery fund, a supplementary budget of US$230 billion passed by the Japanese Government for reconstruction after the March 11 earthquake and tsunami. 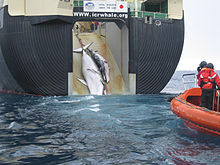 The funding was provided to increase security for the whaling fleet in light of increasing attacks by Sea Shepherd Conservation Society, and justified by the Japan Fisheries Agency as providing support to the whaling industry as a whole, including some whaling towns along the devastated northeast coast. No foreign or donated funds were used. ^ "ICR : Overview and Purpose". ^ "About ICR". Institute of Cetacean Research. Archived from the original on 29 January 2009. Retrieved 11 February 2009. ^ "International Convention for the Regulation of Whaling". Washington DC: International Whaling Commission. 2 December 1946. Retrieved 26 May 2012. ^ "Special Permit catches since 1985". International Whaling Commission. January 26, 2010. Retrieved February 18, 2010. ^ "Whale Sanctuaries - Establishment of the International Whaling Commission's sanctuaries". International Whaling Commission. 1 September 2009. Archived from the original on 18 May 2008. Retrieved 26 May 2010. ^ a b c d "Scientific Permit Whaling - Recent Specific Scientific permits". International Whaling Commission. Retrieved 22 August 2010. ^ "Extract from the full Report of the JARPA review workshop 2007". International Whaling Commission. Retrieved 22 August 2010. ^ a b c "2007 resolutions - Resolution 1 - Resolution on JARPA". International Whaling Commission. Retrieved 22 August 2010. ^ "2005 resolutions - Resolution 1 - Resolution on JARPA II". International Whaling Commission. 10 May 2005. Retrieved 22 August 2010. ^ a b c "Scientific Permit Whaling - North Pacific". International Whaling Commission. Retrieved 22 August 2010. ^ "IWC Resolution 1999-1" (PDF). International Whaling Commission. Retrieved 22 August 2010. ^ a b c d e "Scientific permits - Scientific Committee discussions on the north Pacific permit". International Whaling Commission. Retrieved 22 August 2010. ^ "2003 resolutions - Resolution 2003-2 - Resolution on Whaling Under Special Permit". International Whaling Commission. Retrieved 22 August 2010. ^ "The Report of the Expert Workshop to review the ongoing JARPN II Programme" (PDF). Retrieved 22 August 2010. ^ Biggs, Stuart (30 May 2007). "Kyokuyo Joins Maruha to End Whale Meat Sales in Japan (Update 1)". Bloomberg L.P. Retrieved 5 May 2012. ^ An open letter to the government of Japan on "scientific whaling" Archived 2007-08-19 at the Wayback Machine, New York Times, May 2002. ^ "Research Results - JARPA/JARPAII papers published in peer-reviewed journals". The Institute of Cetacean Research (ICR). Retrieved 26 May 2012. ^ Aron, William; Burke, William; Freeman, Milton (December 2002). "Scientists versus Whaling: Science, Advocacy, and Errors of Judgment". BioScience. 52 (12): 1137–1140. doi:10.1641/0006-3568(2002)052[1137:svwsaa]2.0.co;2. ^ Mott, Richard N. (2003). "Neutral Judges in a Debate on Scientific Merits?". BioScience. 53 (3): 203–204. doi:10.1641/0006-3568(2003)053[0203:NJIADO]2.0.CO;2. ^ Clapham, Phillip J; Berggren, Per; Childerhouse, Simon; Friday, Nancy A; et al. (1 January 2003). "Whaling as Science". BioScience. 53 (3): 210–212. doi:10.1641/0006-3568(2003)053[0210:WAS]2.0.CO;2. ^ "Australia has 'shocking' evidence of Japan's whaling: minister". Agence France-Presse. Archived from the original on 10 February 2008. Retrieved 6 February 2008. ^ "Whale activist gets suspended sentence". The Sydney Morning Herald. ^ Dwyer, Molly (December 17, 2012). "Appeal from the United States District Court for the Western District of Washington Richard A. Jones, District Judge, Presiding" (PDF). United States Court of Appeals. Retrieved December 18, 2012. ^ Thomson, Cask J. (March 31, 2014). "Japan's Whaling Is Commercial and Not Scientific; International Court of Justice Rules". Words with meaning. Archived from the original on 2014-04-02. ^ "Japan's whaling program not for scientific purposes, rules International Court of Justice". ABC News. March 31, 2014. ^ Press, Tony; Jabour, Julia (April 17, 2013). "Australia takes Japan to court on whaling – where to now?". The Conversation. The Conversation Media Group. ^ "Japan accepts court ban on Antarctic whaling". BBC News. March 31, 2014. ^ Sterling, Toby (March 31, 2014). "World court: Japanese whaling not scientific". MSN News. Associated Press. ^ "Japan: Plan for Antarctic Whale Hunt Slashes Target Numbers for Catch". New York Times. 18 November 2014. ^ "Japanese whalers heading back to Antarctic waters without harpoons". ABC News. January 7, 2015. ^ Hasham, Nicole (2018-05-29). "Japan slaughters more than 120 pregnant whales for 'research'". The Sydney Morning Herald. Retrieved 2018-05-31. ^ "'Deeply disappointed': Japan kills 300+ whales for 'research'". The New Daily. 2018-05-30. Retrieved 2018-05-31. ^ "Street Fight on the High Seas". The New Yorker. 12 January 2010. Retrieved 16 January 2010. ^ a b "Japanese whalers get $28m in earthquake cash". 2011-12-06. ^ "Japan Admits Tsunami Funds Used to Defend Whaling Fleet". Mother Jones. 12 December 2011. Retrieved 27 February 2013. ^ "Most Popular E-mail Newsletter". USA Today. 8 December 2011. This page was last edited on 13 February 2019, at 04:09 (UTC).